Gigabyte isn't particularly well known for its GPUs in the UK, and when you look at the OC version we have in our test bench right now you might think that's a bit of a shame. This seriously overclocked version of the GTX 660 Ti, with the impressive Gigabyte Windforce cooling array, is around the same price as both of the Zotac and EVGA GTX 660 Ti SC. Because of the tasty 1GHz+ base clock it posts some competitive benchmark numbers too, taking the GTX 660 Ti in isolation. 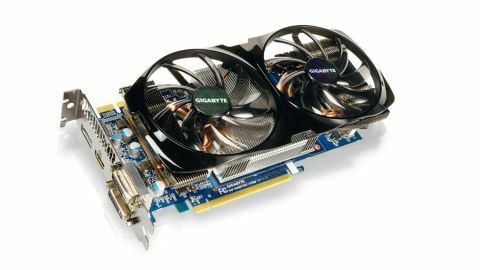 The three top-spec GTX 660 cards here - the Asus GTX 660 Ti DirectCU II Top, Zotac GTX 660 Ti AMP! Edition and this Gigabyte card - all trade blows in different tests, and that's possibly down to variance in testing as well as the different coolers on offer. It's also a little more svelte than the Asus card, though not as ickle as the impressively mini Zotac offering. With both this and the Zotac AMP! edition hitting relatively high clock speeds the overweight Asus card is looking more and more off the pace. But we're in almost exactly the same place as we are with the Zotac AMP! edition. It's a very good example of the GTX 660 Ti, but not necessarily a good example of a graphics card. The GPU is lacking the ROPs and the memory bus of the GTX 670, and that's a card available for barely £20 more. Inevitably then, we've also got to say it's off the pace in a lot of tests compared with the AMD competition.